Qasr Harraneh is the first of the desert castles reached when driving counterclockwise on the desert castles loop. It lies 60km southeast of Amman in the middle of nowhere. Qasr Harraneh has the shape of a solid square, 35m long on each side, and is in a good state of conservation. The castle has four cylindrical towers, one at each corner. The towers are all solid and can't therefore be used for the defence of the castle. 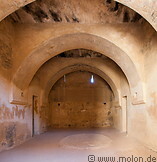 The interior of the castle consists of a number of rooms on the ground floor and first floor. There are no paintings, frescoes or other ornaments.